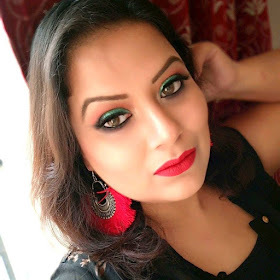 After a numbers of haul posts here i am up with Lakme Aqua shine Lipcolor in shade Fig. Here is the lipcolor.Sorry the picture is blurred...Actually i was so excited to apply the color i hurriedly took the picture...but i hope you can see the color. Instructions of use:- Remove cap.Twist body of pen until the lip color is seen at the tip of the nib.Apply on lips for a smooth, glossy finish. Here is the swatch of the lipcolor ! I was actually bored of my regular pink and brown lipsticks (as i believe these are only two shades that will suit my skin only ! )..so thought to try something different rather than usual pink and brown..so i brought this shade in fig....i was not sure of the color as i just saw the color online and ordered that but i must tell you that i was really happy with the color....so glossy and lovely color. long stay...3-4 hours without food and drink. due to twisting body it is easy to control the excess wastage of product. Suits fair and medium tones Indian skin. As the lipcolor comes in black pen like case so not easy to choose the shade from outside...i prefer transparent case..easy to found among all lippie ! A bit pricey i think. The smell...little odd to my nose (but it vanishes after few minutes). My ratings :-4/5 (1 is for all the cons ). Although of the cons i must say this is one of my favourite lippie and i will recommended to try atleast one shade from this range ! yes it is ruby...lovely shade :) i just love it !